If, like us, you’re still feeling glum about England’s World Cup run coming to end; you’re probably in need of some good news. Well look no further, the biggest game on the planet right now is moving into its new season, which comes complete with a host of exciting new features. Unless you’ve been living under a rock for the past few months, you’ve probably heard about Epic Games’ Fortnite Battle Royale mode that’s turned into something of a cultural phenomenon, as well as changing the industries perception of the free-to-play model. The Fortnite dances have been cropping up all over popular culture, which they’ve even been banned in some schools already. Harsh. A lot has changed within the game since its inception, but season 5 looks to be the biggest update ever introduced. The most obvious change is that Moisty Mire is no-more. 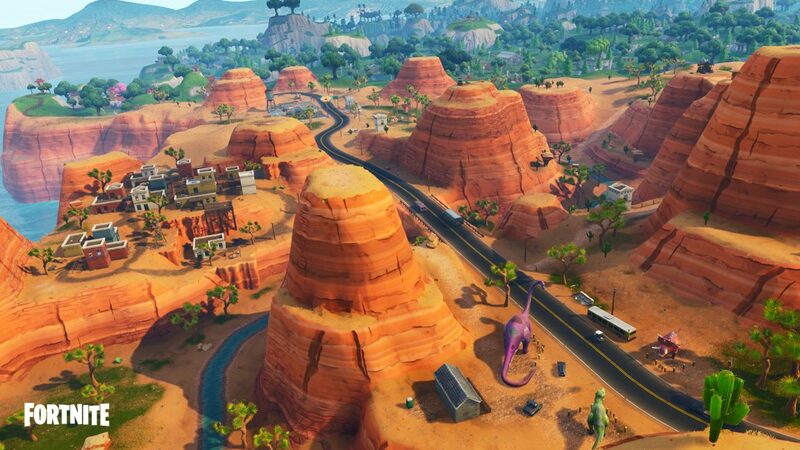 Instead, it has been replaced by a completely new desert region for players to explore, featuring a new POI named Paradise Palms. If you happened to grace the internet over the last week or so, you will have heard about the one-time rocket launch that caused such a stir. This botched launch ultimately caused a time rift that was visible above the map, as well as smaller ones which were scattered around various locations, eventually swallowing some major landmarks. R.I.P giant tomato head. Fortnite is becoming known for its use of themes when heading into its new era, and this time it’s no different. Following the superhero style of season 4, the introduction of rifts has implied a time-travel aesthetic for the latest season. Objects from all kinds of eras are now scattered throughout the in-game world, including a Viking ship and a chariot. Notable changes in gameplay have also been added to keep things fresh, the aforementioned time rifts are now interactive, and can be used to transport players to different sections of the map. We also finally see the addition of a much requested feature; a vehicle that can carry a full four-man squad. This comes in the form of the wacky all-terrain kart, which will become an invaluable asset for quick traversal. That’s just a sneak peek at what’s new in the world of Fortnite, but there’s sure to be plenty more mysteries and secrets to uncover once players start getting stuck in to the update in pursuit of that sweet, sweet victory royale – of which we are no strangers. Epic Games has once again proved that it is one step ahead of the competition, and manages to stand out amongst the crowed realm of tacked-on battle royale modes and cheap knock-offs. Now enough talk, get yourself on that battle bus – where are you landing?